Another week, another really good game development book to review! This time the book in question is ‘Flash Game Development By Example‘, by the prolific game dev’ blogger and self confessed ‘Italian geek’ Emanuele Feronato. If you’ve ever read any of Emanuele’s game tutorials you’ll already have a fairly good idea of what’s in this book, as he takes you by the hand and leads you through all the steps required to create 9 complete well known games from start to finish. Each game gets a chapter to itself and they build in complexity and upon the concepts taught in previous chapters as you work your way through. This is an interesting way of tackling what is quite a daunting range of subjects and works well. Although zero experience is assumed the first chapter dives straight in and has you making things from the start while still explaining basic concepts such as how to set up your Flash movie size and working with Arrays. 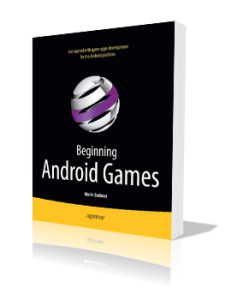 Beginning Android Games is a new book by Mario Zechner and published by Apress. Mario is the very clever chap behind the libGDX library I’ve mentioned here a few times in the past, so he knows what he’s doing. But this book isn’t about libGDX, instead I remember reading Mario saying somewhere that the aim of the book was to enable you to build your own libGDX-like library by the end of it, and that’s pretty much what it does. Cutting to the chase, I’ve only had the book for a day or two and I’ve only had a chance to really skim it so far, but from what I can see this appears to be the best book available for anyone wanting to get into game development for Android devices.